My kids have enjoyed going to the Discovery Museum in Acton for years. It’s a place where a membership is a must because they will want to keep going back. Just this year, they went through a $8.8 million renovation and expansion. We went to check it out to see if they were able to retain their quirky charm and the kids were delighted in what they found. What I loved is that they kept the same rooms that the kids loved- The Train Room, the Bessie’s Diner, Backyard at Night, The Ship Room, etc. They even kept them in the same lay out… they are just brand new and more spread out. Lizzie loved the addition of a baby room that was for ages three and under. It was a calm inviting space where she didn’t have to worry about getting knocked over by rambuncious kids twice her size. She climbed all over the wooden gym, adopted two baby dolls and carried them around “showing” them the rain out the window and pushing them in a cart. There is also a private nursing area that was clean and cozy. 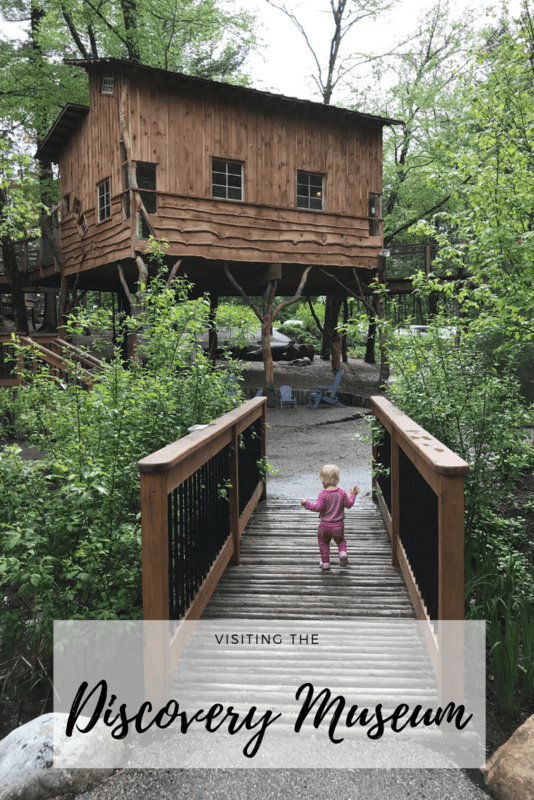 Our absolute favorite place to play was the new addition of a tree house and natural playscape. The kids loved running across the wooden walkway to reach the tree house and then exploring what was inside. There was a naturalist there to teach them some lessons on what they would find in the forest. From there, you can go down a staircase or slide to reach the play area. They ran around endlessly, splashing in puddles and climbing on the beaver dam. Check out their calendar of events for special programming. They also have a new accessibility & inclusion program called Especially for Me. This program will include dedicated hours and free museum admission for families facing developmental challenges such as autism and well as families with individuals who are hearing or visually impaired. The Discovery Museum is such a wonderful environment for learning and growth. I love that they can combine science and nature in such a fun way.